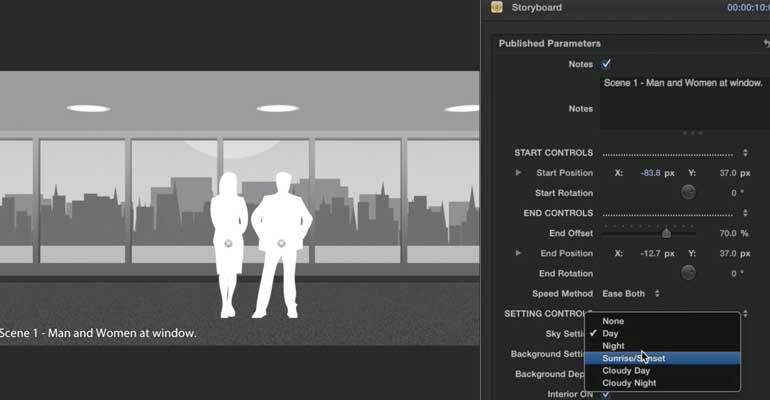 FCPX Storyboard: Corporate is a storyboarding tool created for Final Cut Pro X. This amazing plugin allows film makers to easily articulate their creative vision to clientele and crew members prior to filming. Insert up to 5 characters and create a multitude of indoor and outdoor scenes by mixing and matching setting options. FCPX Storyboard is extremely easy to use. Drag and drop a FCPX Storyboard generator into the Final Cut Pro X timeline. Move the playhead to the first frame of the generator and set the starting position using controls found in the inspector window. Next, move to the playhead to the last frame and set the end position. FCPX Storyboard will do the rest. 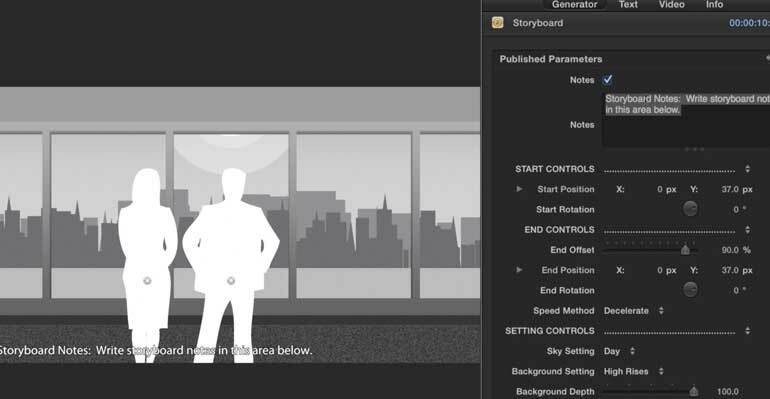 Demonstrate the movement of the camera, position of characters, and provide a general setting for scenes using Pixel Film Studios storyboarding tool for Final Cut Pro X. With FCPX Storyboard: Corporate, editors can professionally articulate their directive vision for clientele or personal projects prior to filming. FCPX Storyboard allows users to bring the scene indoors or outdoors with controls found in the FCPX inspector window. Select the time of day, background setting, interior setting, and even add walls to the room using intuitive drop-down menus in Final Cut Pro X. Mix and match to create a multitude of different scenes. Insert up to 5 men or women within each scene using drop-down menus found in the FCPX inspector window. Orient character silhouettes at any position or depth within the scene to create a greater parallaxing effect. Additionally, utilize the camera controls to add depth of field and focus on individual characters. Learn how to create and customize your very own professional storyboards with the Storyboard: Corporate Lesson. Let’s begin by locating FCPX Storyboard Corporate in the Generators library. Click and drag the Storyboard generator to the Timeline. Select the generator and go to the Inspector Window. First you will notice the notes checkbox and text-box. The notes can be turned off at anytime. Next you can adjust the start and end controls. The start and end controls will be controlling how the camera moves in your storyboard scene. You can adjust position and rotation by adjusting the designated controls. 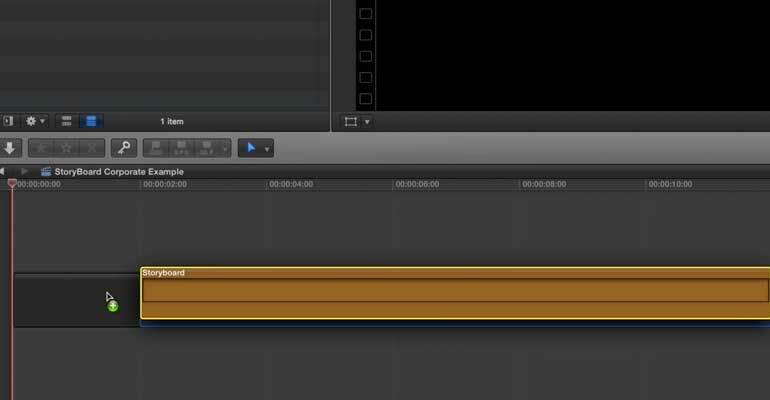 Adjusting the End Offset slider will determine how fast or how slow your camera movement animates. For example moving the slider to the left will make the camera movement slower. Moving the slider to the right will make the camera movement faster. Next you can choose from a variety of speed methods. Once you have the start and ending controls set you can move on to the setting controls section. First start by selecting a sky and background setting. After choosing a sky and background setting you can then adjust background depth. Next continue on by adjusting the interior controls. You have the option of keeping the interior on or off by selecting the check box. Underneath you have a variety of interior options such as setting, ceiling, and floor. After selecting an interior setting, ceiling and floor you then have the option of adding walls. Choose a left or right wall then adjust the wall spread by using the designated slider. Next we will go over the Character Controls. First start by selecting the gender of your person. 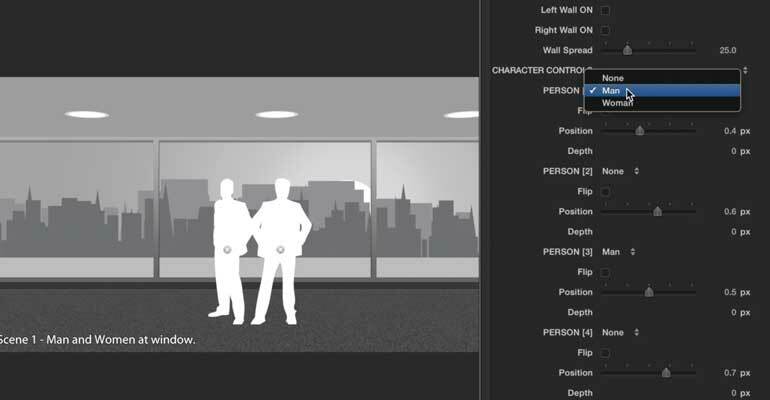 You can add up to 5 characters in your scene which you can flip, position, and adjust depth. If you do not want to position your character using the position slider you can use the on screen controls in the viewer window. Position your characters by clicking and dragging the control puck located on your characters. Now for some final touches. Once you have the your character controls set you can move on to the camera controls section. Start by adjusting the depth of field slider and near fade slider. The Near Fade slider will set a boundary range over which near objects fade in. Where do I find FCPX Storyboard: Corporate? 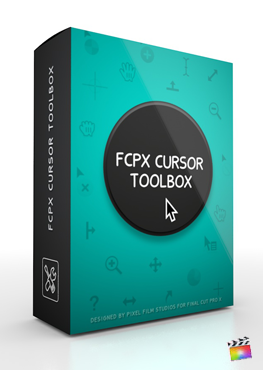 Once the installation is complete, you can find FCPX Storyboard: Corporate in the FCPX Generator library.